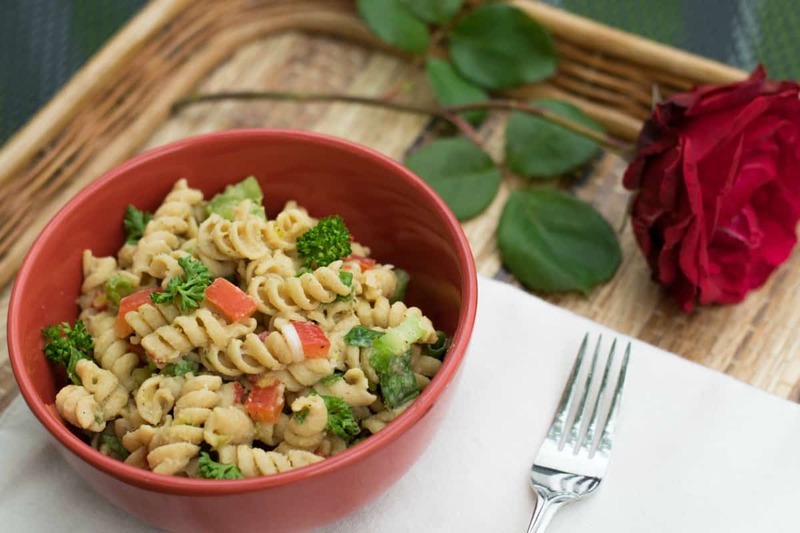 Here’s another summertime favorite: an Oil-Free Vegan Pasta Salad. 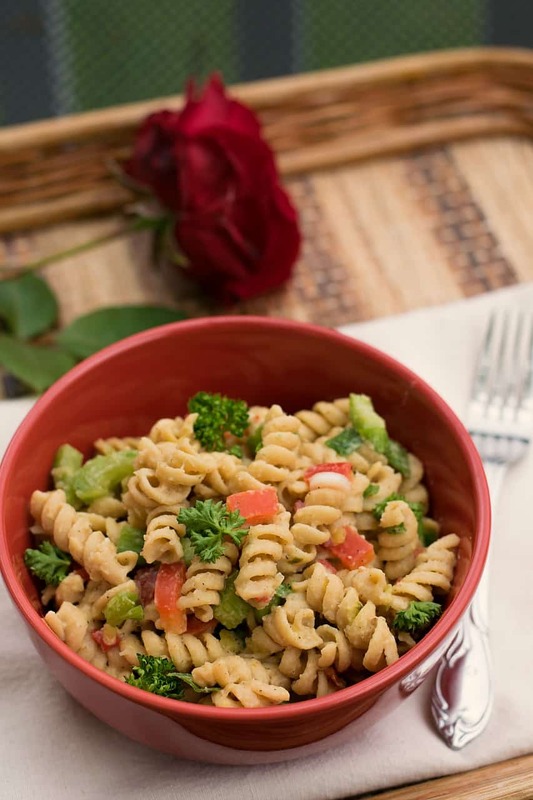 In this recipe, I used healthy whole wheat pasta, lots of chopped veggies, and a slightly modified version of my homemade White Bean Mayo. I see SO many people on Facebook worried about what they can take to a family picnic or company potluck…. We have LOTS of recipes that are PERFECT picnic food, like this Vegan Pasta Salad. You could also take my Vegan Potato Salad, Baked Beans, Potato Rolls and Corn Butter, and don’t forget Jeff Novick’s Black Bean Burgers or my own Vegan Beer Brats. Like I said – LOTS of choices, and choices that even the pickiest omni eater will like. Prepare 4 cups of your favorite pasta. Once the pasta is cooked according to the package directions, drain it and rinse it well, then set it aside while we chop the veggies. I used celery, green onions, red bell pepper, and a little organic radish that was being featured in my local grocery that looked really good. Chop them finely and add them to a large bowl. Go ahead and add the pasta too and give is a stir to mix everything together. Add all the dressing ingredients to your blender, including the juice from the can of beans, and blend on high until smooth and creamy. It may look a little thin, but that’s ok, the pasta will soak it up. Add the dressing to your pasta and mix well until everything coated. 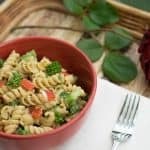 Now just chill that off for a few hours before serving and you’ve got a healthy, oil free, vegan pasta salad perfect for that holiday picnic. Be sure and let me know how you like the Miso in the dressing compared to the Tahini I used in my old version. I like the twang it adds, and I LOVE the fact that it doesn’t add as much fat. Cook Pasta according to package instructions. Drain and rinse well when finished and set aside. Add all dressing ingredients to your blender, including the liquid from the can of beans and blend on high until smooth. It may look a little thin, that's ok, the pasta will soak it up. Gently toss pasta and veggies together and fold in dressing. Gently stir until everything is well coated. Cover and chill in the refrigerator for at least 1-2 hrs before serving. How much liquid is it if I cook my own beans & don’t used canned? Looks so good, I love pasta salad! Lately I have been using pasta made from chickpeas, gluten free, and really just as delicious. Chuck!! This is very good! We are a household of 2, so I made 1/2 the macaroni salad recipe and 1/2 of the potato salad recipe. The “dressing” for both so similar, I simply blended the same ingredients together then split them into 2 one-cup containers. I then whisked in the ingredients specific to the macaroni salad and the potato salad. I also added some horseradish to the potato salad, because, well horse radish! Both are very good. I’m inclined to tweak a bit next time. They lack a little zing. I’m thinking more pickle juice for sure. I used a tsp of horseradish and I’ll up that to two tsp. But they are coming to the baseball game with us tomorrow, that’s for sure. Oh, for other readers, when you first take it out of the fridge, it has an usual look to it; almost like it’s congealed. Run a fork through it, and it’s normal again. I’m pleased to have these in my rotation! Thanks Chuck!! The dressing for this recipe is awesome. I have used it for sandwiches in place of mayo. Used it for potato salad. It’s delicious! And it keeps very well in the frig, if it lasts that long. Thank you for giving me my potato salad back!! Great pasta salad recipe! I made this for a 4th of July cookout. I add some cauliflower, extra pimentos and extra relish. Delish! Thanks!